If there is one thing that can make anything better that is salted caramel. That combination of salty and sweet, it's just perfection. This fall treat has just that. I discovered these bars last fall. Thanksgiving was around the corner, and it was my first fall with a gluten free diet. And well, you just don't do fall and Thanksgiving without Pumpkin Pie. Now I could just make a gluten free pumpkin pie, but when you come across gluten free Salted Caramel Pumpkin Bars that just sounds a million times better. What I like most about these bars it that they are made with almond meal (or almond flour) which helps to pack them with protein, making them a filling treat. Side note, I was able to find almond meal/flour at Trader Joe's for $4.99 a bag, where as everywhere else it was nearly $8 a bag, so keep your eyes open! Preheat your oven to 350 degrees, and grease an 8x8 baking pan. In a large bowl whisk together all of the ingredients. Bake for 18-24 minutes, or until the bars are cooked through. Remove and cool. While the bars are cooling prepare the frosting. Using a mixer, beat together the cream cheese, butter, powdered sugar, and milk. Spread over cooled bars. Drizzle bars with caramel, and then sprinkle with sea salt. There you have an easy and super tasty Thanksgiving dessert. I even made these for my family last Thanksgiving, and kept my mouth shut that they were gluten free, and packed with protein, (because then for some reason everyone automatically assumes they are going to be gross) and everybody loved them. Enjoy! Those look so good girl!!! Definitely saving this recipe! I've already eaten half the pan - guilty! Yummy! I'm in charge of the pumpkin dessert for Thanksgiving this year, so I may have to try this out. Thanks for sharing! Give them a try, they are soo yummy! I totally ate the whole pan this week! YUM! 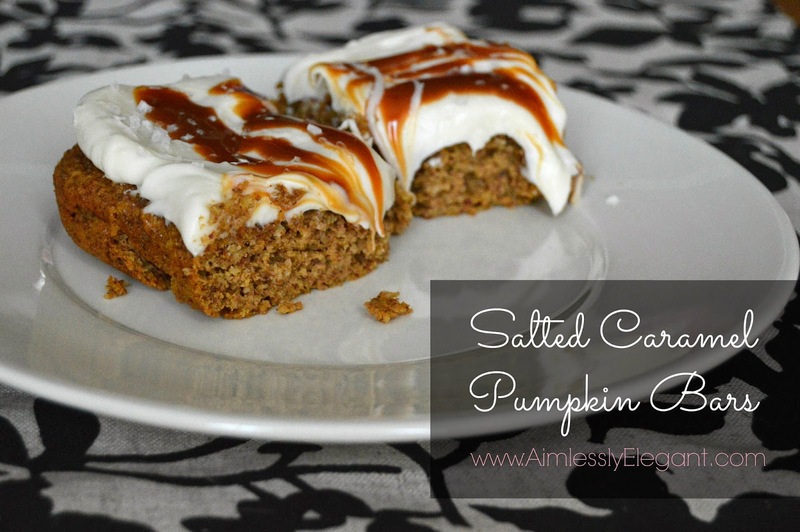 I'm a huge fan of salted caramel anything so these are right up my alley! Right, if it says salted caramel I'm on board!